This isn't a trivial exercise in semantics, about 70% of self-described ABM programs aren't actually enacting the strategy at all. Groundbreaking research of more than 500 Account-Based programs quantified this point. In this blog article, we unpack the rationale for why so many programs fail to realize the benefits of ABM. 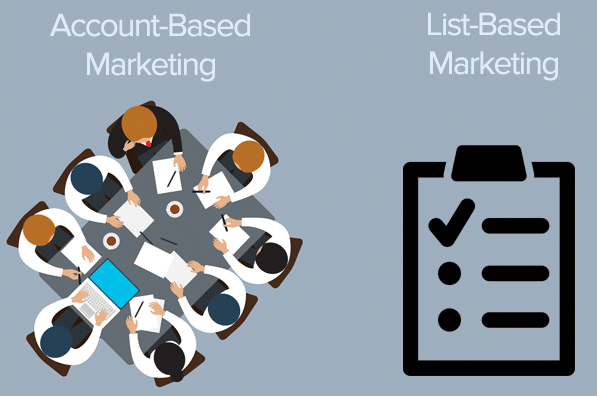 This blog entry is a deeper dive into a Salesforce blog article I wrote with 3 CEOs in this space – “Are you a List-Based Marketer or Account-Based Marketer?”. The joint conclusion... if you're not planning and developing your program at the account level, you're most likely doing List-Based Marketing. What's old is new again. For most, Account-Based Marketing today looks a lot more like List-Based Marketing of 20 years ago. List-Based Marketing was once a common outbound marketing strategy. B2B marketers supported sales focused accounts with tactics a range of tactics - like telemarketing, direct mail, content syndication or email. Constraining exposure based upon a list of accounts, this proved to provide an efficiency measure compared to more broad or contextually constrained outbound activities. As marketing automation gained traction, we saw a transition to Leads-Based Marketing. Here, the context of account targets was loosened and the strategy became the use of technology to sort the “wheat from chaff”, finding those who appear to self-identify a deep interest. As Account-Based Marketing came into sight, the promise was to shift the marketing outcomes from lead volume to quality of engagement and revenue velocity for target accounts. This also sought to reset the relationship with sales organizations who not always found the quality of company or contact coming from Marketing Automation to be a good fit with their experience at closing deals. Shifting from Leads-Based to Account-Based Marketing, most marketers kept the balance of their approach in the familiar marketing automation camp. Presumably 70% grabbed at target lists and started driving messages. Missing the point that a lot of marketing and sales activities already existed with these accounts, these programs took on the characteristics of a List-Based approach - simply filtering outbound activity. Without the plan to move accounts through stages of engagement, coordinating the myriad of existing account-centric sales and marketing activities, you will never recognize the promise of ABM... marketing efficacy - revenue velocity through the purchase process. This isn't conjecture, we've done the research. Only 18% of self-described ABM programs produce measureable, positive revenue impact. Of these high-performance programs, 85% prioritize account level insight and planning, create content that speaks directly to these needs, and can tailor messages across channels as a way to drive relevance and engagement. In our landmark whitepaper, "Definitive Guide to High-Performance ABM", we outline the paths of building a new program and revising an existing program facing these challenges. Download it and find your path to true Account-Based Marketing.